From Hirtshals to Kristiansand by ferry. Then to the most southern end of Norway, Lindesnes. 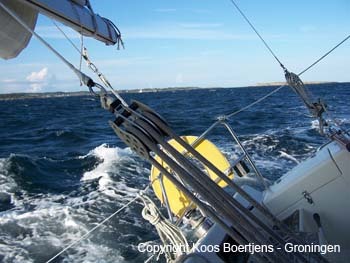 Along the E44 we follow the coast to Stavanger heading for Bergen. More pictures The famous composer Eduard Grieg was living in Bergen and also the violinst Olé Bull. The Bergen kunstmuseum has a lot of pictures of Eduard Munch and of the French impressionists. From Bergen we drove eastward to the Hardangervidda. From Finse (1300mtr) we made a tracking to the gletsjer. We walked for 2 1/2 hours through rocky slopes, with snowcovered rivers and no vegitagion at all. On our way to Oslo we passed Gardos. Here you can still see the marks of a meteor which fell down 650 miljon years ago. In Oslo we visited the museum Fram. This ship played a key role in the discovery of the North and South Pole. The Vigeland is a must to see in Oslo. Vigeland was a sculputre and made this park with hundereds of sculptures of human beings in different poses and situations. Eduard Munch, the famous Norwegian painter left most of his paintings and drawings tot the city of Oslo. Here you find the 'Cry' and the 'Madonna'. 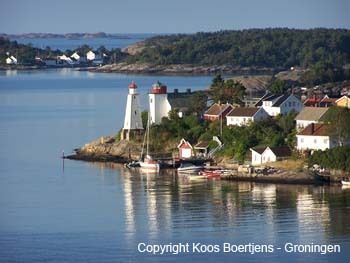 Arendal is a small town on the southcoast of Norway (50 miles West of Oslo). You have a wonderfull few on the Fjord. If there is an occasion to beat the waves, just go. Every Wendnesday evening local sailors meet at the sailingclub and have a two hour competition.